I was recently invited along to a Thatchers Tasting Event which was held at Pasture Bristol. The weather on the day was beautiful, which was the perfect match for tasting some ice cold ciders. On arrival we were given a glass of the Family Reserve to taste. At first this could have easily been mistaken for champagne or prosecco. The bottle itself is one usually linked with a sparkling wine. I absolutely loved the taste of this cider as it was incredibly refreshing and looked almost too classy to be a cider. After meeting everyone, we were seated and handed out our menus. Pasture were kind enough to prepare separate menus for those who had special dietary requirements. All of the dishes were paired with a carefully selected Thatchers Cider. I was extremely happy to receive my vegetarian menu as all of the dishes sounded incredible. The first dish was the Tempura Jalapeno, served with lime and cream cheese. The heat of the Jalapeno was perfect for me. The cider paired with this dish was Thatchers Katy. The combination of the two worked really well together. The second dish was Forgotton Onions En Croute with Summer Squash, paired with Thatchers Haze. Thatchers Haze is a drink I absolutely adore. It isn’t the conventional cider and it is one you could drink any time of day. We then went on to try the Smoked Beetroot Tartare and the Truffle Mac & Cheese, both of which were incredible. I could eat whole bowl of the Truffle Mac & Cheese as it was so beautiful and cheesy! These dishes were paired with ciders that I had not tried before. The Thatchers Vintage was definitely my favourite drink. I can already tell that I will be buying a few more bottles for the summer. It is such a light cider to drink it goes down very well. I also had the chance to try out Thatchers Red Streak and Thatchers Old Rascal. Both of these are ciders that I wouldn’t usually pick, but I am so glad I had the chance to try them. Although they are darker coloured ciders, they are both so refreshing and I couldn’t believe what I had been missing. We ended the evening with a Hazlenut Eclair paired with Thatchers Summer Vintage. Thatchers Summer Vintage is a new range out and I would recommend that you try to get your hands on it. I had such an incredible evening and I feel as though I have become obsessed with cider ever since. Who would have thought that Thatchers has so many delicious and different varieties of cider?! I recently had the chance to try out the new Beets ‘N Roots Cafe in Bristol and I was so impressed. You may have seen this cafe on Instagram already as everything on their menu looks incredible and it would just be rude not to post about it. Beets ‘N Roots is based on Cotham Hill Bristol which is a great location, it’s surrounding by the cutest boutiques and charity shops. The cafe itself serves organic food and the menu only features vegan and vegetarian dishes which is perfect for me. Along with their incredible food, they are also well known for their freshly prepared smoothies and juices. I was so excited to try out their menu, the only problem was that they had so much to choose from. After much consideration I decided to go with the Buckwheat Pancakes which were topped with banana, chocolate and maple syrup, sprinkled with coconut shavings and pumpkin seeds. I was so happy with my choice as it was absolutely delicious! Along with this incredible breakfast, I tried out their Red Juice which contains Beetroot, Apple and Lemon. This juice was so refreshing and fruity. I was really surprised with how much I liked this juice as I am not a huge fan of Beetroot, but the ingredients worked so well together. After stuffing my face with pancakes I had the chance to make my own Smoothie Bowl. There are many different versions of these bowls on the menu and they all look great. I will definitely be recreating a few of them at home. One thing I really liked about Beets ‘N Roots is that they have a cute outside area which is perfect for when the sun is out. I picked the perfect day to visit as I enjoyed topping up my tan whilst filling up on their goodies. If you’re looking for a tasty place in Bristol to go for Breakfast, Brunch or Lunch then you should definitely check this place out. Not only is their menu tasty, but it’s all good for you too which is even better! Last week I was lucky enough to attend a sneak preview of the Lace in Fashion exhibition at The Fashion Museum in Bath. The exhibition runs from February 4th 2017 until the January 1st 2018. On arrival we were welcomed with refreshments and had a chance to admire the collection whilst waiting for everyone to arrive. We were then given an amazing tour of the collections, enabling us to revisit the history behind each piece. It was interesting to see how lace had began as a hand made art, taking hours to complete and only to be worn by the wealthiest of people. Many of the pieces we visited included collars and cuffs, carefully designed and perfected by delicate hand made lace. It was amazing to see how far lace had come in terms of both technology and fashion. Lace can now be easily found on both the high street and catwalk, which makes it interesting to see how it has transformed throughout the years. There are many collections to see, featuring some interesting and inspiring work. Glamorous pieces come into play throughout the exhibition and there are some beautiful dresses which definitely caught my eye. If you’re looking to spend the day admiring wonderful fashion, then I would definitely recommend you head to the Fashion Museum in Bath. Not only will you find this extraordinary collection, but you can venture through galleries filled with historical and contemporary fashion. There are also several courses and classes available at the Fashion Museum if you wish to learn more about lace. You can find a list below, along with the full schedule on their website. Last Thursday I was lucky enough to attend a blogging event to celebrate the release of Bridget Jones’s Baby. The event was held in three venues, all of which you will find in Aspects Leisure Park in Kingswood, Bristol. There were seven bloggers attending in total and our first stop was Chiquitos. My plus one and I had arrived at the event early, so I was able to get some snaps of the amazing set up before the rest of the girls arrived. The staff working in Chiquitos that night had set up a cute little table for us all, filled with nachos, cocktail menus and even a sombrero each. The atmosphere in the place was great and it wasn’t long before the cocktails started flowing and our starters arrived. The table was filled with so many delicious dishes, including battered Piña Colada prawns, chilli and cheesy garlic bread, along with several traditional Mexican platters. These went down very well with the wonderful cocktails they had to offer us. My favourite cocktail being the Gin Fizz. After feeling very full from our starters, it was then time to head across the car park to Pizza Hut Restaurant. The Pizza Hut Restaurant in Aspects Leisure Park Bristol has recently been refurbished and it looks incredible. The restaurant has a real American Diner feel to it which we all enjoyed. After being offered various new pizzas and sides from their menu, I finished my evening feast with a bubbly glass of prosecco. Once we had finished stuffing our faces, it was time to head over to the main event. With less than a five minute walk away we arrived at Vue to watch Bridget Jones’s Baby. We were lucky to have the back row of the cinema reserved for us, which made the experience even more incredible. The film itself was hilarious and I would even go as far as saying it’s the best one yet. I had an amazing evening and met some wonderful people. It was great to experience so many different establishments, all in one place. If you’re looking to spend an evening dining in a great restaurant or visiting an entertaining bowling or cinema complex, then you should definitely try out Aspects Leisure Park. Festival season is among us and it is clear that some of us are more prepared than others. Not everyone is constantly living the festival season lifestyle, so it is important that first time festival goers prepare themselves in order to attend a festival in style. By the end of this post you are sure to find out how prepared you really are when it comes to the festival season and also see whether or not you need to do some last minute shopping! What’s the first thing you pack for a festival? The main factor to determine whether or not you are prepared for festival season is to think about what would be the first thing you pack when getting ready to attend a festival. Most people will run to the dry shampoo and factor 30 and although they are useful products to have with you, you’re not really doing it right unless you are well prepared with a bum bag full of glitter and face paint. What’s your main colour scheme for the festival? Don’t get me wrong I love wearing anything black, but for a festival it’s important you step it up a gear and experiment with the brightest and funkiest patterns you can find. The greatest thing about a festival is being able to wear a multi coloured lycra outfit and not be judged for it. If you need any ideas then below are some outfits and pieces which you will find in Topshop and Burnt Soul. As with any event, it is important that you match your outfit with the perfect accessories. If you’re a regular festival goer then you will already know that any tribal or aztec jewellery you own will look perfect with your outfit. If you’re new to the scene and are looking for some guidance or a piece which you are able to match with multiple outfits, I advise you invest in a cute floral headband or a bright statement necklace. If these make it through the festival then there’s no harm in bringing them along next year! Is there such thing as sensible footwear? No matter what the weather forecast states, it is inevitable that throughout the festival you will come across generous amounts of mud. With this in mind wearing sandals to a festival is a very bad idea. Not only will your feet be covered in whatever mess is around you, but is it more than likely that your feet will get stood on and crushed in the crowds. You’re better off sticking to trainers or wellies when attending a festival as they are both comfy and practical. Worried about not having a make-up kit and blow dry on hand? If you’re the type of girl who loves make-up and couldn’t imagine a weekend not being able to spend hours making sure your hair and make-up is perfect, then attending a festival will definitely be a challenge for you. A few tips to consider before attending the festival is learning how to plait your hair if you don’t already know how to – this will save your life when you find your hair turning greasy and frizzy. Another tip is to have your eyelashes and brows tinted before the festival so you don’t have to spend time applying mascara and brow tint to them. If you are really struggling with the idea of no makeup then you could always invest in a good BB Cream and a product such as Nars The Multiple, a 3-in-1 product which can be used on your eyes, cheeks and lips. The most important thing to remember when preparing for a festival is to enjoy yourself. Once you get there you will be having so much fun you won’t be focusing on how you look and you will soon realise that everybody else is in the same boat as you. Don’t let not having a make-up bag and shower on hand discourage you from attending! This weekend I was lucky enough to be invited to a fashion blogger event at Lan LLofft in Cardiff. Lan Llofft is a Welsh Boutique which has shops in Cardiff, Machynlleth and Lampeter. The lovely boutique features brands such as French Connection, Sugarhill, Darling, Great Plains and many more! When I arrived at the event I was greeted by three lovely ladies who work in Lan Llofft in Cardiff and they immediately made me feel welcome. The shop itself was filled with lovely spring colours and many outfits stood out for me due to their cute floral patterns. Once everybody had arrived, we were told that if we wanted to we could put together an outfit to try on and have our photograph taken in order to gain a chance at winning the outfit later on in the event. Of course I jumped at the chance and decided to go for a beautiful kimono paired with some amazing lilac heels and a lovely white clutch. After we had a chance at playing dress up we had a chance to get to know the women hosting the event and learn a little bit about the company. I was so pleased to find that everyone attending the event was so friendly and the day truly was wonderful! After stuffing our faces with the refreshments they had kindly offered us, Bethan (a lovely woman who organised the event) presented us with goody bags to take home. I was so pleased to find that my bag included a stunning gold necklace, along with a blue and purple floral scarf which I will definitely be wearing this spring. I was also given a lovely tote bag and a discount code which will be perfect for my next shop at this wonderful boutique. I am so happy to have found this boutique as both the staff and the clothes they stock are amazing! If you’re shopping in Cardiff or in any of the other towns mentioned then I would definitely recommend you check this shop out! This week I was lucky enough to be invited to yet another amazing blogging event in London. As London Fashion Week continued, The Bloggers Hangout invited a group of bloggers to come together in order to network with each other, along with having the chance to meet some amazing brands and review some great products. After a long morning travelling from Cardiff I was pleased to be greeted by a friendly bunch of bloggers and welcomed into the wonderful venue. Once inside I met with many fabulous brands such as Ark Skincare, Naturigins Haircare and Heaven Skincare. It was so lovely to talk with so many amazing companies and find out about many new and upcoming brands. As the event was very popular, it was great to be able to have a break and taste some delicious products such as Pics Peanut Butter, Bluebird Tea Company Tea, COYO Natural Yogurt and of course try out the refreshing Cranes Cider and Cocktail Mania Cocktails. I was able to pick up many contacts as well as some great products to try out and review for myself which will soon be featured on my blog. I had such an amazing day and met some really nice people! Thanks again to The Bloggers Hangout for inviting me to this event and I cannot wait to see what the next event has in store for me. 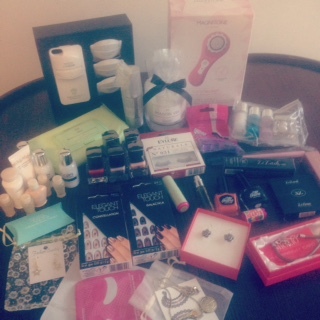 Keep out an eye out for my upcoming reviews on the many products I received at the event! On Monday I was lucky enough to spend the day at the Bloggers Fashion Week organised by The Bloggers Hangout. Before attending I had never been to a blogging event as big as this and it’s safe to say it definitely exceeded my expectations. The event was based in the OXO Tower Wharf in Southbank London and I couldn’t have picked a better location myself. The rooms were decorated beautifully and the view from the event was stunning. When I arrived I was amazed by how friendly everybody was and the brands were very helpful in introducing their products. My a few of my favourite brands from the event include Magnitone London (who kindly gifted me a Vibra-Sonic Daily Cleansing Brush which I cannot wait to try out), True Brit London, Motel and Halo Hair Extensions – along with many more which I will be sure to mention in my upcoming posts where I will be reviewing their products. The event was split in to two sessions with both including a fashion show which was a great way to break up the event and keep people entertained. The atmosphere was incredible and I am so happy that I decided to travel to London to attend the event. After spending six hours there I was exhausted, but I managed to pick up plenty of information and business cards from the brands I met. It’s safe to say I cannot wait to review the items I was so generously gifted. As you can see it is going to take me a while to get through them but I am determined to review them all. I am so pleased to have made so many contacts and I can’t wait to attend my next event!